THIS PRODUCT WILL NOT WORK WITH THE 8 FOOT ROD. 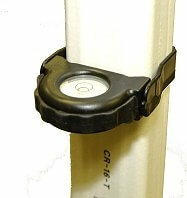 This Rod Level works with Seco's CR 16-foot and 20-foot Series Grade Leveling Rod ONLY. Grade Leveling Rod is sold separately. Snap arms fold away for convenient storage and will fit easily into a shirt pocket!